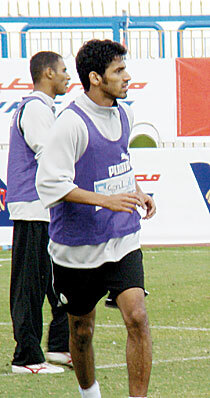 ESMAILIAH, 21 November 2007 — Brazilian coach Helios Dos Angos is keeping the faith in the Saudi national team to bounce back from a 2-1 loss against Libya when they play UAE today in the 11th Pan Arab Games football competition. Gametime is 6:15 p.m. (Saudi time) at Al-Esmailiah stadium here. Dos Angos said, “When we chose the squad we had faith in their talents and were sure they could make it till the end.” Even if the skills varies from one athletes to another, he added, they will try to help them bring their best. “We have one goal and will work on achieving it,” said the coach. The team had won their first match against Sudan 2-0 but then was beaten by Libya 2-1. In both matches Saudi fans and the team themselves were not happy with their performance. “This is a dear championship for us and as Arabs we all try to compete with honor and pride. Though some national teams did not participate, or did participate with their Olympic teams, this might have lessen the excitement a bit but at the end it is still a way of gaining experience,” said Abdulrahman Al-Qahtani. He promised disgruntled fans they would do better after the disappointing game against Libya. “Each game has it conditions for sure for example the team were a bit exhausted and the ground was not smooth as it should be, but we will try to avoid repeating our mistakes and will focus on winning,” he said. “We have two more matches to go against UAE and Egypt, and our goal is definitely to win them both though the second will be more exciting to compete with the defending champions and hosts of the event,” said Abdulrahman. Saad Al-Harthi, nicknamed Raoul of Arabia, also believed that as Arabs they have to try their best and show the world the progress of our football through these championships. “Hopefully tomorrow we will present a thrilling game with our sister country from the Gulf UAE and at the end what matters is the performance and it should be good,” said Al-Harthi. Meanwhile, 50 years have passed since the first Saudi football team was formed in 1957 to participate in the 2nd Pan Arab Games in Lebanon from Oct. 12 to 28. Back then the team were not very successful yet that team shared the same dreams with those that followed after them. Though the beginning was not successful during the following participation leaving it without any medals in the event the team have shown great progress in the following events. In 1976 they were bronze medalists in Syria, in 1992 they were silver medalist in Syria again. Egypt was 4 times championed in 1953, 1965, 1992, and in 1994. Morocco twice in 1961 and 1976, Jordan twice in 1997 and 1999, Iraq once in 1985 and Syria once in 1957. The first team had footballers from Makkah and Jeddah, and the supported by the late sport leader Prince Abdullah Al-Faisal, former chairman of Al-Ahli Club. The team was captained by Abdulmajeed Kayyal, and included Al-Toum Jabbart Allah, Abdulminim Al-Rizgan, Abdulrahman Al-Juaid, Al-Haj Basadeeg, Abdulhafeiz Mirghani, Abdullah Abdulmajid, Hassan Doush, Ahmed Al-Yafii, Bashri, Mohammed Al-Jarban, Sulaiman Habash, Omar Hamid, Sulaiman Basri, Abdulmajeed Bakur, Ameen Harasani, Jinja, Salih Adani, Abdullah Hijazi, and goalkeepers Ahmed Mahmoud and Yaseen Salih. Coach Abdulrhman Fawzi and assistant coach Labeeb Mahmoud joined the delegation too. According to Kayyal, who became coach of the team and still continues to follow the succeeding national teams, said it was a whole new experience back then. “It was the first time to play on grass fields and had to buy new shoes and get used to wearing them and playing with them,” he said. “It was the first time for us to learn how to deal and play with foreign national teams who were way advanced than us and it was also our first time to play at night under floodlights,” he said. For the present team, this is also a sign of continued success for the Kingdom and Abdulrahman gave the assurance they will try to keep up the good work and achieve something this time with the team spirit and prayers of their fans.